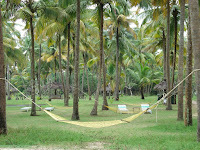 The resort is around 60 kms from Ernakulam railway station. With the exorbitant charges for pickup claimed by the resort, we decided to arrange on our own. Thanks to the taxis right outside the station, we were able to reach the village for a reasonable price. The vast expanse of the greenery inside the resort took us by surprise. After the registrations, hubby and I headed to the restaurant for a cup of tea. We couldn't wait to go near the quiet beach. It took us some time to accept the fact that the clean beach was all for ourselves. A few fishermen were setting off at a distance. Since this is the end of off-seaso n, very few visitors from abroad were staying in the resort. A row of hammocks beside the shore was a perfect way to relax and unwind. While admiring the serene surroundings and the tall coconut trees, our stomachs started to growl and we had a nice, sumptuous breakfast. There are many activities that one can take up within the resort. Country Boat rides and sunset cruises are also available but at an extra cost. As we have already experienced these boat rides in Kumarakom, we decided to spend the time in the resort for the next 2.5 days. The naturalist took us around the resort, explaining about different flora and fauna. The vegetable garden, recycling mechanisms, bio-composts and other treatment plants show the environment friendly mechanisms they have been adopting. 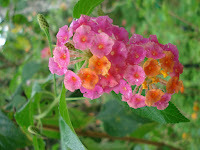 He is a very good photographer and helped us to take some amazing snaps for spiders, butterflies and fishes. It was a bright and sunny day and our moods were upbeat. Lazing around on the hammocks with the breeze gradually taking us to a short nap - one might appreciate the complete relaxation. We spent the evening in the beach, enjoying the sunset and collecting sea shells. Even the waves didn't want to disturb the peace prevailing in the beach that they decided to keep it low. Cookery show by the chef gave a glimpse of the preparation styles of traditional fish curry of Kerala. Having shown tremendous interest during the show, the chef was wondering why I didn't taste the dish. A vegetarian by nature but doesn't mind watching the preparation of non-veg dishes - that's me! The day ended with a romantic, candle light dinner and live classical music. Thunderstorms and heavy rains woke us up the next morning. We prayed that the sky clears up fast so we could get bathed in sun's rays and get tanned. Our prayers were answered and we celebrated with a bicycle ride around the village. The roads were very bad but there was just no traffic. While hubby enjoyed a swim in the pool, I finished reading an interesting book "A year by the sea". To wrap up the relaxation process, we tried out some meditation in the evening along with a guide. 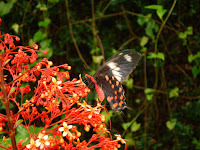 The next morning was the tryst with beautiful butterflies in the garden, with my camera trying to capture the beauty as much as it can. After a heavy lunch, it was time to bid goodbye to the resort and head to the railway station. The sun didn't want to bid farewell so it had sent its dear friends, black clouds and downpour. We just loved this place and it was a memorable experience. CGH Earth does it again, after our superb Coconut Lagoon experience. A trip to Marari Beach can relax, refresh and rejuvenate. 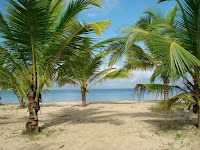 Marari Beach resort is a preferred choice among tourists planning something along the lines of a beach holiday.